Greenland: The UK’s Strategic Partner in the North? In the light of the recent developments in the UK, Lana Ollier, Associate at Polar Research and Policy Initiative, speaks to Inuuteq Holm Olsen, the very first representative of Greenland to the US and Canada, about Greenland’s exit from the European Union, its growing opportunities, and the possibility of closer cooperation between Britain and the northern triangle of states including Greenland, Iceland and Norway. This is the first interview of our ‘Polar Matters’ bimonthly interview series. Geographically a part of the North American continent, but politically and economically closer to Europe, Greenland hasn’t always had it easy when it comes to establishing itself as an autonomous nation. With new opportunities arising from a changing climate, it appears that the largest island in the world is increasingly finding its voice. There are a variety of reasons we should keep a close eye on this small nation, now and in the future. Especially for the UK, which shall be exiting the European Union, looking northwards might present all of the countries concerned with new opportunities. Tell me a little bit about your current work as Minister Plenipotentiary and Head of Representation for Greenland in the US and Canada. I am the official representative of Greenland here in the United States, which also includes being the representative to Canada, as of late last year. 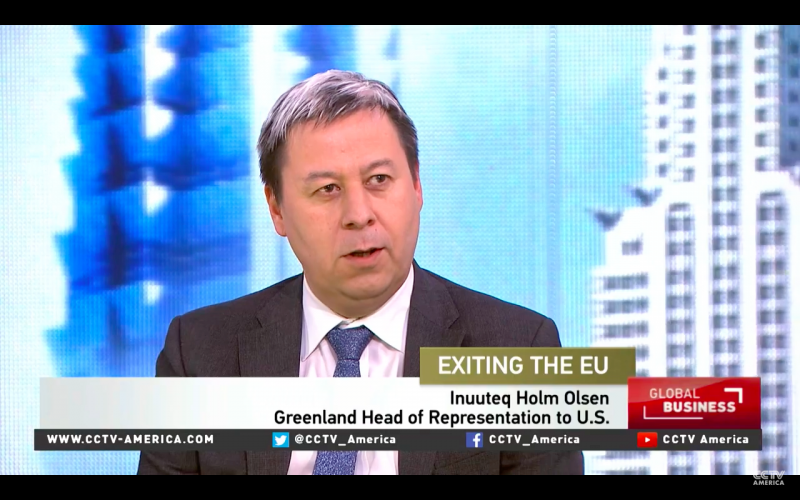 My goal is to represent Greenland’s interests to the US, as well as to Canada. I also work on establishing closer ties with both countries, particularly with regards to commercial and economic interests in sectors that Greenland seeks to develop further. When you represent a country, you obviously represent all the sectors. So, in the end, it is many different areas that I am working on – both in the political sphere and the scientific one. Basically, we are trying to advance Greenland’s interests and the possibilities that exist for cooperation. So, we are working with both the federal and state governments whenever there are mutual interests. I have been here for two and a half years, and I had to build it up from scratch, because I am the first representative in the US. So, it takes time; I am very aware of that aspect, but I can clearly sense an increased interest in the Arctic, as well as in Greenland, so I feel very fortunate to work here. What are the mutual interests with the US and Canada? If you look at it from a geographical point of view, Greenland is a part of the North American continent. In that sense, we have some mutual interests when it comes to shippingespecially with the potential of traffic increasing in the Northwest Passage. Politically, historically, and economically, we have been very close to Europe for many years and decades because of our relations with Denmark, but geographically, there are some states in the US and Canada to whom we are much closer. We also share a lot of their challenges and possibilities. The state of Maine, for example, is trying to develop its northern profile. They see themselves as a gateway to the Arctic, and they are trying to develop that profile further in cooperation with Greenland and other Nordic countries. Also, we have a lot of the same industries – for example, when it comes to rare earth and other minerals. Also, if you look at the North American Arctic geographically, it is a huge land mass and ocean, and that presents us with similar challenges, and you have the Inuit population in North America and Greenland, who share a lot of the same issues – both when it comes to social and environmental issues, as well as trying continuously to improve the overall living standard. Do you see an increasing number of Americans embracing their identity as an Arctic state? Arctic identity is definitely a challenge when it comes to raising the profile of the Arctic agenda here in the US. In Washington D.C., you have so many competing interests, but at the same time, you can also sense that the US is taking this issue much more seriously. There has been a lot of policy development here in Washington. Many of the think tanks are now engaging themselves in Arctic issues. There is a continuous effort to raise the Arctic agenda, but that is definitely something that needs to be worked on. Politics always comes in to play as well, especially with regards to climate politics. When Greenland first left the EU, you were trying to engage in a process of nation building. How was this process developed, and where are you currently heading as a country? When we got Home Rule in 1979, in essence, we wanted to control the sectors and issues that directly affected the people of Greenland. That has been a long process, maybe much longer than the forefathers of the Home Rule arrangement foresaw. When we started in that process, we also had to start with education and infrastructure – very basic issues. Also, we had to start developing different economic sectors, because the economy hadn’t been developed at all. It has taken us thirty years until we realised the Greenland Home Rule Act of 1979. The Act on Greenland Self-Government of 2009 enhances that process, with which we will continue to engage. An interesting aspect of the Home Rule process, which no one in Greenland and Denmark had foreseen, was that the foreign affairs aspect would develop so much. There is not much mentioning of that fact other than that Denmark is responsible for foreign affairs and security, but that is something that we have developed as we have taken on more and more of the areas of responsibility, because there is always an internal as well as external aspect to a lot of political issues. So basically, we will continue this process of nation building. And that is both raising the education level of the people, as well as continuing to develop economically, which obviously is a requirement to continue the political process of taking over responsibility. Are the Greenlanders satisfied with this process, although it probably has taken longer than first expected? Is there still support for this agenda? I think so. I think we can see that looking at the referendum of the Self-Rule Act, which was supported by 75% of the people. The referendum was in 2008. I think, at that time, there was a bit of a general high, with market prices of oil and minerals being skyrocket high, but, of course, there was a collapse of the global economy and, thus, a collapse of the prices, and a lot of that high didn’t really materialise, but we are still confident that we will get there. There was some exploration for oil in 2010 and 2011, and people were excited about that, but it didn’t turn out as well as expected. With decreasing oil market prices, companies rather continued their explorations elsewhere around the world, where it is less costly to explore, so that has been put on a temporary hold. In general, however, we are beginning to see an improvement, both in the economic numbers, and in the unemployment numbers which are continuing to fall. This is also due to some of the mineral development which is taking place, albeit at a small scale. Of course, there will always be elements in the population who are more impatient than others – those who want to see things go fast, but I think there is a general consensus that it is not about the time, but really about the process. It has to be sustainable development and not forced. You mentioned that, due to climate change, there is an increasing interest in Greenland. What opportunities does that provide for Greenland? Generally, there is very little knowledge about Greenland in the US, and many other counties for that matter. So, when we can generally profile Greenland, that is a positive thing; one thing often leads to another – people will want to know more about it, and other things will come up, so it really triggers a process. It is true; we have seen increased scientific interest over the past couple of years because of the ice caps melting and its effects on rising sea levels, which will have an effect on many coastal areas worldwide. I don’t think we want to necessarily capitalise on climate change tourism, but we do hope that the increased interest due to climate change will lead to a more general interest; I have certainly noticed in my years working here, and talking to the people here, that there is an increasing interest. Twenty years ago, a lot of people didn’t even know where Greenland was, whereas now, when Greenland comes up, they somehow automatically connect that with climate change – that is where they get their information from. It has been argued that with new Arctic possibilities arising, such as more shipping, mineral and oil exploitation, Greenland would have difficulties managing those opportunities independently. Is that the case, and might that be a reason to rejoin the EU? Mineral, oil and gas exploration – those are sectors we have been working on for 20-plus years. We have been independently working on developing the whole context of those operations, at the administrative level and the regulations. We obviously have the potential for more tourists, but we are restrained by the infrastructure – that is both in terms of the airport as well as hotel capabilities, but we are engaging in a number of infrastructure projects now, especially to increase the number of tourists that will be able to drive directly to Nuuk or Ilulissat and other places. It is not something that comes to us externally, which we cannot handle, but something that we have decided to engage in, so I don’t think that is going to be the reason for the EU issue to come up again. Do you think that the debate on rejoining the EU is going to come up again? There are some political parties, some of the smaller ones, which will sometimes raise the issue. They think, if we will join the EU again, that we are going to get the infrastructure money. So, they believe we could use that money to develop airports and ports, but it usually falls deaf on most people’s ears. We have a number of agreements with the EU, and we have very good relations with the EU. As long as we are in this process of nation building, where we haven’t taken over all areas of responsibility from Denmark, rejoining the EU would mean that we have to give back whatever it is that we gained in terms of responsibility. Also, we have seen some unfortunate examples of issues where we have moved further away from the EU. For example, with the EU seal ban, and ban with our quotas regarding whales and the International Whaling Commission (IWC). As long as you still have opposing views on those principles, most people will be quite reluctant to lose those competencies that we have. Iceland voiced multiple times that with the UK leaving the EU, there would be a chance of the UK joining the northern triangle of countries – Greenland, Iceland and Norway. What is your take on that? I think it is a good opportunity for the UK to take another look at what’s north of the UK terms of the possibilities. The UK is very close to the Nordic regions like Iceland and Greenland. That presents an opportunity for the UK to play a much bigger role when it comes to issues north of their country. The Nordic countries are aware that they share a lot of similarities with the UK. I hope that the policy makers in the UK will see this as an opportunity and try to focus more on what they can do to increasingly cooperate with the Arctic and Northern countries. The Nordic countries, as well as Scandinavia and Iceland and Greenland, are cooperating through the Nordic Council and the Nordic Council of Ministers. They have been cooperating a lot, for a number of years now, also on Arctic issues. I think this represents an opportunity for the UK to gain a foothold in an important region of the world that is going to continue to gain importance in the future. What are the similarities between the Northern countries and the UK, and where can they come together? These are very well-developed countries and economies. The UK has a long-standing interest when it comes to Arctic issues and has a historic engagement. Fisheries are also an important sector in which the UK is engaged. In that area, there are also a lot of similarities with the Northern countries. Also, when it comes to climate change and renewable energy, there is a lot of potential to come together. I think there is a lot more that connects the UK with the Northern or Arctic countries than that which divides them. Those are also historic connections, not least because of the geographic proximity. How do you perceive the chance of the UK joining the Nordic Council, and closer cooperation in general? That will be up to the UK to decide, and it will take some visionary leaders to see that possibility. So, you can only hope for it, but also it will be up to the UK people and politicians to make that decision. You just mentioned cooperation within the Nordic Council, and that with increased fishing and shipping in Arctic waters, there is also a need for stronger cooperation between the Arctic countries. What do you see in the future of Nordic and Arctic cooperation? It will only grow from here. There is a lot of awareness that Arctic issues, be it maritime, shipping, oil spill prevention, or search and rescue, cannot be solved by any country alone. We need to coordinate and cooperate a lot more, also when it comes to developing the economic resources, and solving a lot of problems that the Arctic countries are facing. With that awareness, Arctic cooperation, based on what already exists, will grow. At the moment, this process appears to be moving quite slowly – for example, in the context of the Arctic Council. Why is that? The Arctic countries are not a unified entity; you have different opinions on what the Arctic Council should do, and where they should cooperate. Although the Arctic Council is the only forum that connects all eight Arctic countries and indigenous peoples, it is not the only forum to engage with those issues. As I said, the profile of the Arctic has been on a rising path, and it will continue to develop. So, looking at this from a perspective where only the countries represented in the Arctic Council are the legitimate actors is just a wrong assumption. I think there are numerous ways of engaging yourself with different Arctic countries, and to cooperate with them outside of the Arctic Council. So, do you see this moving forward in terms of bilateral agreements and cooperation? Both, bilaterally and also more informally in regional forums – for example, in the Arctic Circle Forum. There are many ways of promoting your interests and capabilities. Also, the Arctic is a huge area. It is very different from east to west. So, it is not always necessary to engage with all of the eight Arctic countries at all times. Traditionally, there has been stronger cooperation with the EU and US in Greenland. Do you also seek further means of cooperation with Asian countries? We are engaged with Asia. I mean, Asia is an emerging region that is also showing a lot of interest in the Arctic, and the possibilities there. We are already engaged with China, Japan and South Korea. Those are also potential markets economically, so it is an important region to engage with, and we are doing that.